Just Another Brick in the Wall that Stops Chlorinated Compounds in their Tracks… A Permeable BOS 100®Barrier! - Remediation Products, Inc.
25 Aug Just Another Brick in the Wall that Stops Chlorinated Compounds in their Tracks… A Permeable BOS 100®Barrier! 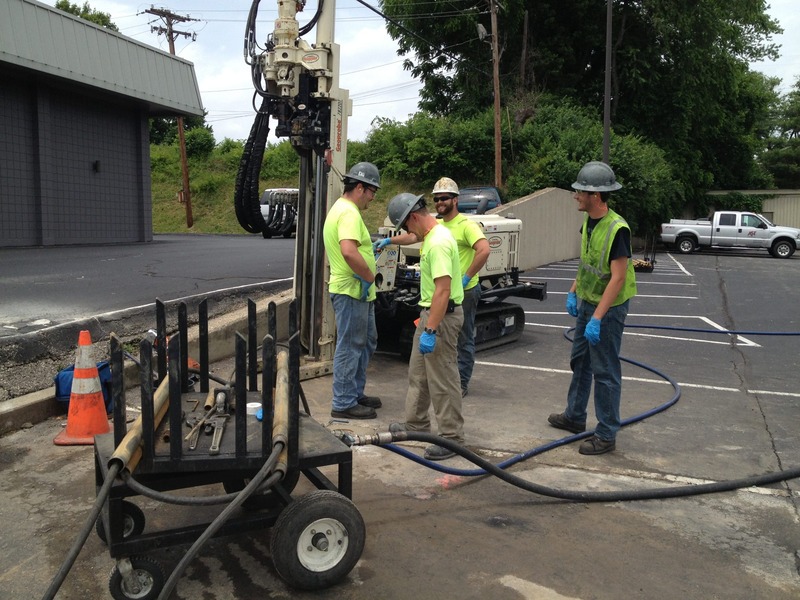 Linebach-Funkhouser, Inc. (LFI) and AST Environmental, Inc., (AST) team performed groundwater remediation at a former dry cleaner site in Clarksville, Indiana. The work consisted of multiple phases including the investigation/design characterization, source treatment and downgradient plume remediation. The combined onsite and offsite contaminant plume (> 5 ug/L PCE) is estimated to be >500,000 sf. Given the large area of impact, traditional area wide treatment was impractical. Following the investigation/characterization to define the horizontal and vertical extent of impacts as well as groundwater flow characteristics, LFI/AST developed a two-tiered approach by performing source treatment in the immediate area of the former dry cleaner and a series of down gradient barriers at the property boundary and offsite using BOS 100®to Trap and Treat the CVOC plume. Source remediation was performed in Spring 2014 while the down gradient barriers were installed just last month in July. Source remediation consisted of injection BOS 200® in the overlying clays (10’ to 20’ bgs) to address sorbed contaminant mass in the saturated zone. The two downgradient barriers were installed primarily in the underlying sands beneath the overburden clay which was the predominant migration pathway. The property line barrier was approximately 180 linear feet (lf) and consisted of 4 rows of injection points where 8610 lbs of BOS 100® was installed. The offsite barrier consisted of approximately 5 rows of injections points and was approximately 120 lf. Approximately, 60 points were used to install 5,880 lbs of BOS 100®. The property line and offsite barriers were designed for a ~10 year barrier life. As part of the effort , AST implemented a high velocity injection approach to ensure property distribution of BOS 100® within the saturated sand. This injection system utilized a dual pump approach using two pumps in parallel capable of delivering the BOS 100® at velocities in excess of 12,000 feet per minute (fpm). This ensured fluidization of the sandy saturated zone to effectively distribute the product.